Soybean is rich in protein, which is great for the humans and animals eating it. But this high protein content comes at a cost. To make protein, soybean plants need a lot of nitrogen. The plants get some of the nitrogen they need by working with specialized bacteria in the soil. These bacteria live in root nodules. They pull nitrogen from the atmosphere and convert it to a form the plants can use. But this process-biological nitrogen fixation-may not provide all the nitrogen soybean crops need. Farmers may have to apply nitrogen fertilizer as well. A new study, however, shows it's possible to increase the number of soybean root nodules–and the bacteria that live there–to increase crop yields. This could remove the need to apply additional nitrogen fertilizers. "That opens the possibility of achieving higher yields of soybean based exclusively on biological fixation," says Mariangela Hungria, a researcher at Embrapa Soja, Brazil. Hungria, lead author of the study, and her colleagues coated soybean seeds with the bacteria (the usual method used by growers). They supplied additional bacteria by spraying it on the plants during other stages of growth. 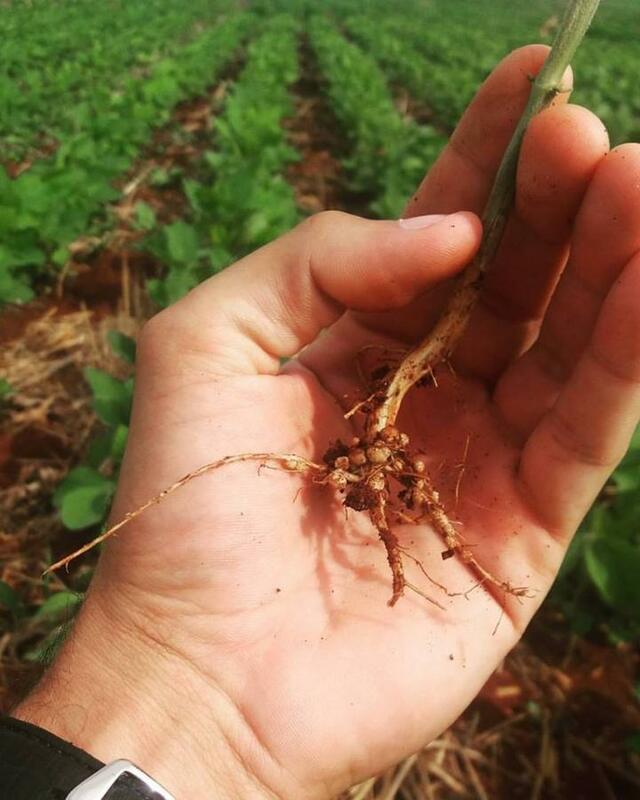 Soybean plants that received the additional spray inoculation developed more root nodules. And more nodules led to higher yields. In fact, adding bacteria to seeds increased yields by 27% and 28%. Spraying bacteria on the soy fields during growth pushed up yields even further. The increase in root nodules after additional spray inoculation surprised Hungria and her colleagues. Previous research indicated that each nodule makes it more difficult for soybean plants to develop subsequent ones. But in this study, soybean plants were able to form new nodules when researchers provided more bacteria. "To discover that nodules aren't regulated as strictly as previously thought is an important finding," says Hungria. "The limitation happens particularly at the beginning of soybean growth when the first nodules appear." After that initial stage, more nodule growth is possible. More biological nitrogen fixation, and less nitrogen through fertilizer, can also increase sustainability. First, it reduces carbon emissions. Nitrogen fertilizers are usually produced using fossil fuels. "For every pound of nitrogen fertilizer manufactured, at least 10 pounds of carbon dioxide may be released," Hungria states. The second improvement in sustainability is on the field. Excess nitrogen fertilizers from the field can flow into bodies of water. Too much in an aquatic ecosystem can cause algal blooms. These deplete the water of oxygen and lead to "dead zones" devoid of life. Biological fixation using bacteria, however, means more of the nitrogen is used by the crop. Less fertilizer use also has an economic impact. Nitrogen fertilizer costs can add up quickly, both for farmers and for countries. Brazil imports about 70% of the nitrogen fertilizers used in the country. Several farms in Brazil began using the study's strategy in October 2016 (the summer crop in Brazil). Initial results have been promising, says Hungria. The higher soybean yields seen in the study are sustained on these larger scales. Hungria thinks these results will extend beyond Brazil as well. "But they have to be verified because the genetic background of soybean is different in each country," she says. Collaborations with Kansas State University, to verify if the results can be extended to the U.S., have just started. Researching bacteria and nitrogen fixation may just be the beginning. "I think microorganisms can be the 'stars' of a new era of agriculture, in which we consider not only food security but also sustainability," she says. Read more about Hungria's research in Agronomy Journal. The research in Brazil was funded by Universidade Estadual Paulista, Fundação Agrisus, Embrapa, and Total Biotecnologia.